One of my greatest joys in youth ministry is watching students take the next step in their faith by serving others. It’s hard to top the feeling of watching teenagers minister to others in your church, in the community, and, often, around the world. When I started in ministry, I didn’t think I had the time to launch—let alone grow or develop—a student leadership program. I wanted to, but there was just too much “other stuff” that seemed to occupy my attention. Thankfully, someone challenged me to invest into a small group of student leaders and I’m so thankful I listened. As a result, our ministry expanded its reach to sport teams, drama clubs, student councils, and families in a way I never dreamt possible. Now it’s my turn to pass on that same challenge. I want to help you build your Student Leadership teams through our DYM Student Leadership Conference (SLC). 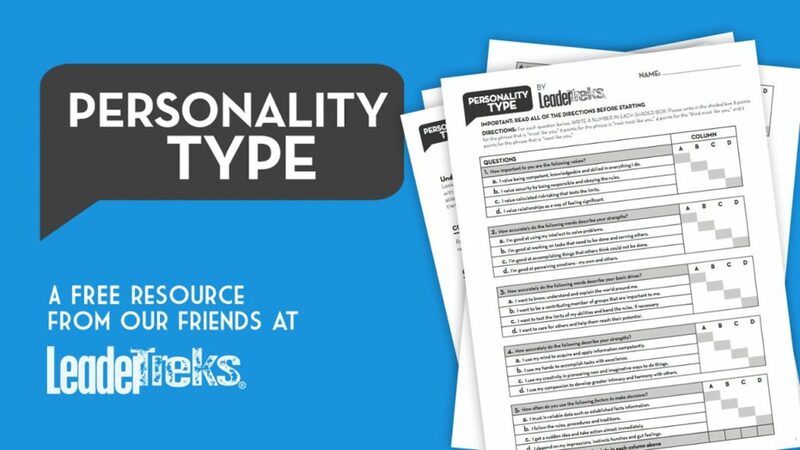 Our friends at LeaderTreks have developed a great quiz to help students find their unique personality type and learn how they can use who they are in leadership roles. You can use this as an exercise during your regularly scheduled Student Leadership gathering or as a challenge or ‘next step’ for a few of your key students. If you’d like to get a FREE copy of Student Personality Types, the reproducible survey (print and make as many copies as you need! ), to use with your group CLICK HERE. We’re so excited that Doug Franklin, the founder of LeaderTreks, will be joining us for SLC again this summer! Whether you’ve spent years developing your student leadership team, or you’re just getting it off-the-ground, or you really want to launch one but are unsure how to begin, this event is a great way to help your students find—or more deeply understand—their role as leaders. This summer, we’ll be holding the DYM Student Leadership Conference in 3 different cities around the US (Azusa, CA; Granger, IN; and Duluth, GA). As you look at how you can develop your student leaders, I hope you’ll consider bringing them to one of these life-changing, ministry-shaping conferences.